What If Changing Your SOCKS Could Instantly Change Your Life? Dr. Mackowsky will perform tests during her extensive evaluation to determine if there is a postural shift that is affecting one’s vision system that VoxxLife insoles/socks can help improve through neuroreceptor activation on the bottom of one’s feet. The BrainTap headset is an extraordinary new technology on the leading-edge of vision/brain-based wellness approach being advocated by Dr. Mackowsky. In order to overcome the brutal effects of stress, you need to get out of the fight-or-flight response and into a relaxation response. The relaxation response can’t happen as long as you generate a certain frequency of brainwave activity. Your brainwave activity must dip into the frequency that allows intuitive and creative processing. Unfortunately, this mode is difficult to maintain. This is where the frequency following response generated through the BrainTap headset comes in; it keeps your brain engaged. By using the BrainTap headset, your brain is being trained to generate this brainwave frequency. How does BrainTap do this? The BrainTap headset delivers gentle pulses of light through special earphones and from within a visor. These lights synchronize with two types of sound to produce deep and profound relaxation and varying states of consciousness. While research has proven that both flickering light and synchronized tones can produce relaxed states, combining the two entrains the brain to the specific wave frequencies known for deep relaxation and heightened states of consciousness which allows the autonomic nervous system (ANS) and brain to become balanced. A 50-minute therapy training session will be recommended. You will need to bring along any smartphone or tablet that can operate Apple or Android apps. The BrainTap app will be downloaded to your device and a demonstration will be provided on how to use the headset. 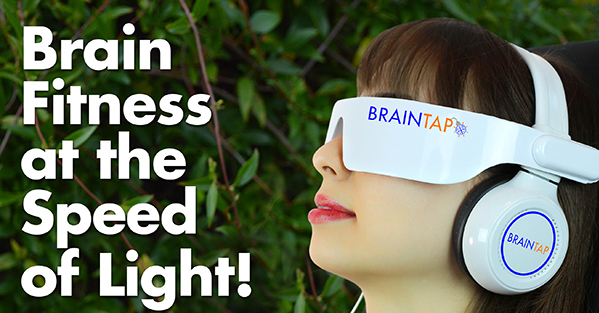 You will then undergo a 15 to 30 minute BrainTap session to experience the mixture of light and sound frequencies that will start to improve your brain/ANS balance. Why should I use the BrainTap Headset? The relaxation response replaces the fight-or-flight response. Serotonin levels increase by up to 21 percent, calming the mind and body. Because 20 minutes on the BrainTap Headset can be like getting four hours of sleep, you will find yourself sleeping less yet feeling more rested. Handling and managing stress becomes seemingly effortless. Best of all, these benefits can be achieved in just a few relaxing minutes a day!